Sometimes I am a very stupid Crumpet. 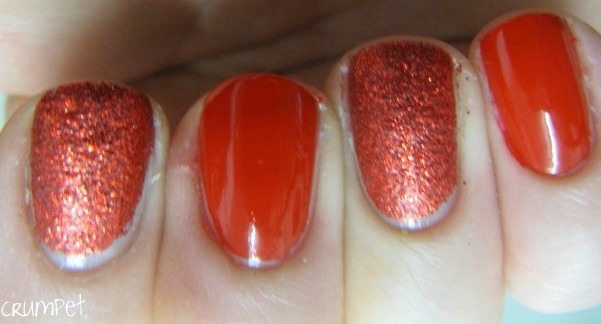 The reason I follow other people’s blogs is to see fabulous nail polishes, especially the ones I can’t get in the UK. 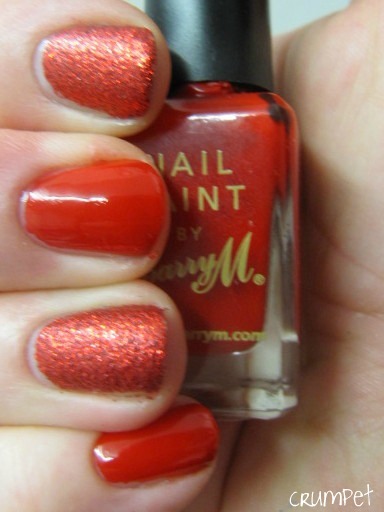 It soooooo never occurred to me that US readers would want the same from a UK blogger – so here, in response to many requests, is the first in a series of posts about good ole Barry and his M.
One of the things that really makes me laugh about Barry M is that he is the polar opposite of OPI when it comes to polish names. “No it’s just RED. Plain, simple, unconfusing bloody RED!!!!”. Lol, I love my melodrama. 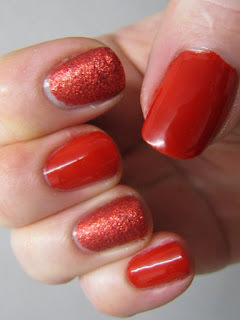 So here we have Bright Red, and her glittery cousin … wait for it ….. you’ll love this …. 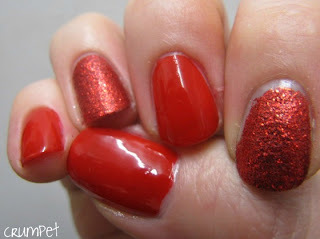 Red Glitter!!!!! Oh Suzi Weiss-Fischmann would be sooo proud. Bright Red is a pretty bright red, (ooooh, wonder if that’s where Barry got the idea for the name?) towards the start of the red spectrum, so no hints of darkness, just pure bright redness. This reminds me a lot of Wet n Wild’s Everybody Loves Redmond. 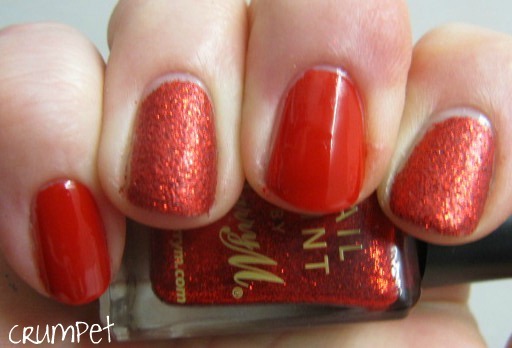 Red Glitter – this was 3 coats. Very similar to NUBAR Fire Sparkles. Very sparkly but goes on matte. You can easily shine this up with some topcoat, but I actually quite like the contrast here. This would be a good “plain but different” Christmas party combination. 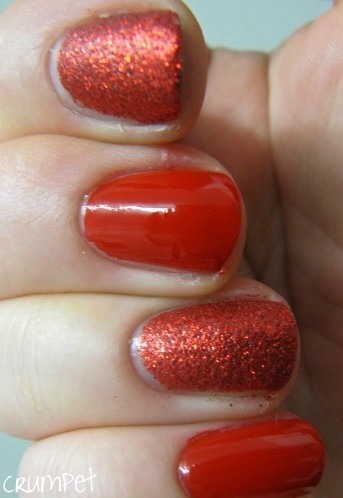 I was being lazy swatching them both together, but I actually like this look – I might try a few other crème / glitter skittles like this. 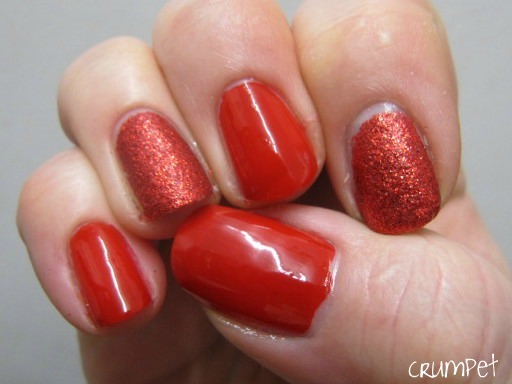 So there you have it – Bright Red, which is a bright red, and Red Glitter, which is a red glitter. Suzi would be sooooo sad ….